The result of the independent Polish studio Pixel Crow's cooperation with 11 bit studios, the creators of This War of Mine. Beat cop is a point-and-click time management game. You play as Jack Kelly, a former NYC detective who was framed for murder and demoted. A time-management point-and-click game released for PC. Beat Cop is the result of the independent Polish studio Pixel Crow's cooperation with 11 bit studios, the creators of This War of Mine. The protagonist of Beat Cop is a NYC policeman, Jack Kelly. When he gets unjustly accused of murder, his promising detective career falls apart and Jack is demoted. His personal life is not much better, and to make things worse, he's at odds with the local mob. In the face of utter failure and hatred of the general public, Jack's only goal is to discover who framed him. His success depends on the player’s decisions — the plot of the game is non-linear and there are many endings possible. Beat Cop was heavily inspired by American crime movie and TV shows from the 70s and 80s, such as Kojak, Columbo, Magnum or Miami Vice. Thanks to many references and unrefined jokes, the game successfully emulates the distinct atmosphere of that age. Even though Beat Cop seems like a standard point-and-click game at first, the gamplay also features time management elements. When patrolling the streets of Brooklyn, Jack needs to quickly react to any criminal activities in sight, write tickets, etc. — just like a policeman should. Apart from that, he's also trying to discover who framed him. In order to achieve that, he needs to talk to the local lowlifes, gather evidence and avoid various kinds of danger. Beat Cop for PC is a single-player game only, and the basic game mode is the story campaign. 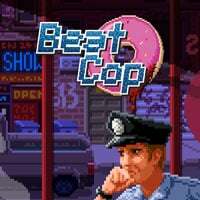 Beat Cop for PC has a distinct retro feel. This is evident not only from the 2D pixel art graphics and a classic interface, but also from the oldschool background music. Rather quietly, overshadowed by triple-A releases, comes a game worth noticing. Beat Cop is, in some respects, quite similar to Papers, Please, but in this case, we can choose between good and bad cop.